Barbara Gordon has had a heck of a time of late, what with supervillain vendettas, setting up a new energy company and trying to find time for romance. Given an opportunity to catch a breath, and with money no problem, most of us would grab our other half and take off on a nice holiday. Not Babs. Yes, It's bye bye Burnside as Barbara Gordon journeys to Japan, but she's on her ownio, having broken up with goodlooking, smart, rich and extremely nice Luke Fox because... comics. Ah well, she's got a new young man to hang out with. An old new young man. Where would superheroes be without long-lost friends we've never heard of? Still, Babs gets a familiar face to make Japan seem less strange and Kai provides a bit of a mystery in the good boy/bad boy department. He seems so obviously set up as a bad lad that I'm betting he's an Interpol agent or somesuch. One of Babs' reasons for being in Japan is to check out a superhero forbear, the wonderfully named Fruit Bat. Suffice to say, she turns up and is adorable. Less pleasing to Babs is this gal. ... why am I second guessing when there's so much to enjoy as Hope Larson becomes the new Batgirl writer? Babs is incredibly likeable - smart, funny, brave as heck. Kai(incidence) is the most adorable big lug since She-Hulk's lovelorn Pug (and if Kai's not worked out Babs is Batgirl, he's achieving a level of dumb never previously measured). Fruit Bat is one feisty grandma, while 'Sailor Clown' has some serious moves. And the art - Rafael Albuquerque's linework is ridiculously vibrant. Batgirl is the proverbial pocket rocket, all grace and confidence. 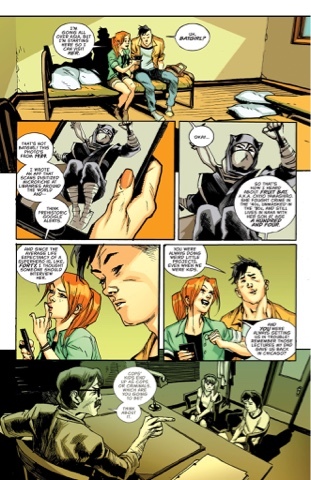 For most of the book, though, Babs is in civvies, just hanging out with Kai, and the pages look wonderful... the body language, the emotions, they had me right there with the characters (never has a line for the bathroom looked so good). 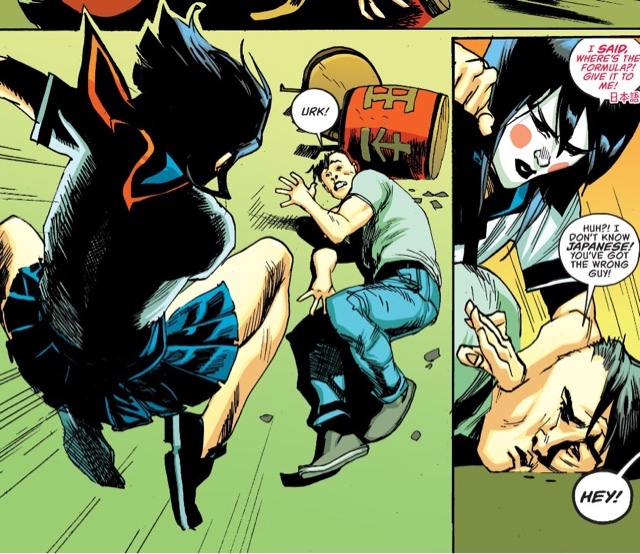 The highlight of an issue without a single dud image is the big fight involving Babs, Sailor Clown, Fruit Bat and Kai - the dynamism is one long teachable moment for young artists. 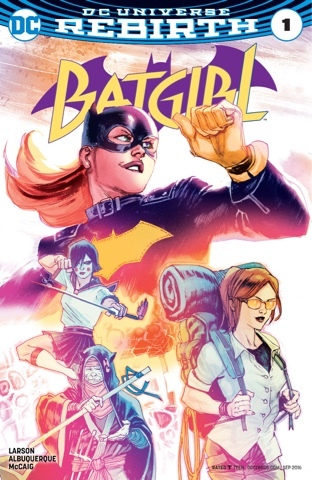 When the new direction for Batgirl was announced - our heroine goes east to find herself - I was pretty unenthusiastic; in superhero comics East Asia means ninjas and mystical masters and Black Canary happy to be beaten up with bamboo sticks. I've had a bit too much of that over the years. But this comic? 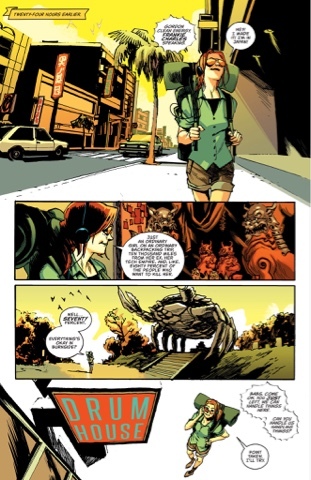 It's something else ... OK, there's talk of Babs finding a teacher but one issue in and I have faith Larsen and Aluquerque aren't taking us to the Hidden City of Cliche. Quibble, quibble, must find quibble. Albuquerque might consider a background artist, he - or perhaps colourist Dave McCaig - relies on a dot pattern backdrop rather a lot. Then again, I like dots... (see what I did there?). McCaig, always an asset, does a lovely job giving this book its own feel via his application of unusual tones - the yellows and oranges as Babs arrives in Japan, for example. 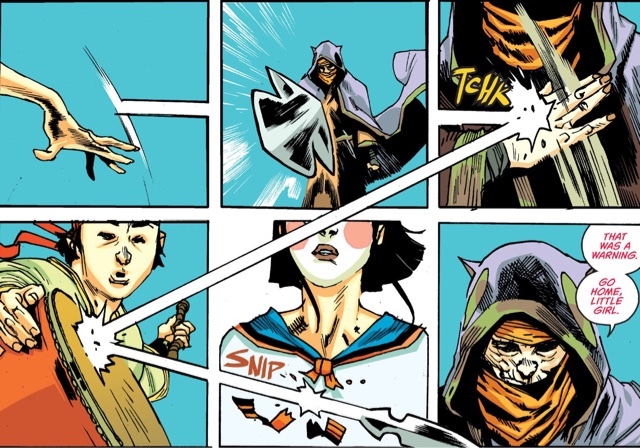 And letterer Deron Bennett goes the extra mile with Japanese characters or words (I am not proud of my ignorance) at the corner of translated word balloons. I guessed it was telling us we were getting a translation and a happy online device informs me that's pretty much the case. It's a small thing, but an example of the thought and care that's gone into this relaunch from the editorial stable - or maybe, dojo - of Mark Doyle and Rebecca Taylor. Add in two wonderful covers, one by Albuquerque, t'other from. Francis Manupul, and you have possibly the best DC comic this week. It's funny, I started out not wanting to read about Babs in Japan; now I'm up for a whole world tour. So, is Fruit Bat inspired by Mr. Burns on "The Simpsons" as Fruit Batman? Is Babs still written as a teenager? Are the lotta dots shout outs to the forgotten Harvey Comics superstars? You've been so wonderful at showing us the variant covers, but you tease us with just one this time, why, sir, why? I've only seen about two episodes of The Simpsons - it's on every night so they never a need to watch! Sorry about that cover, I had it all nice and cropped, but it was very late here in Scotland... it's there now. Fishies! I think she's written in her early 20s. I think she's been written that way for a while -- since maybe the beginnning of the New 52! -- but a lot of us old fogies forget how young people act in their early 20s, and mistake it for teens. And Mart -- kudos for Kai(incidence)! This was a terrific book. I suspect I'll only be able to afford one book between this and Birds of Prey, and it looks like this'll be the one that makes the cut. Then I shall keep you appraised as to doings in new Bop. As if you've only watched two episodes in its almost 30 year history. For shame! I kid. Thanks for the cover upload, though you needn't apologize. I just like giving you hard time. Thanks for your reviews. I picked it up today, and I don't know what to think of it. I only read a few issues of the previous series. I suppose I'm just not used to Barbara's new personality. I find it jarring. I'm afraid I find DC Super Hero Girls' Babs to be more mature/ less anoying. I did like Fruit Bat, that she's a Golden Age super hero - is this the firt we've seen of such a thing in this universe? I did like that it is upbeat unlike the first ish of the last series which showed a man being killed, drowned by a water hose pushed down his throat. 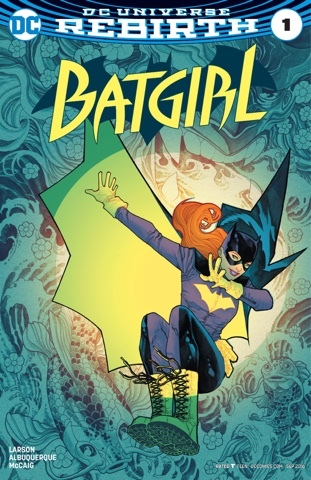 I was with the burnside book, so a slightly younger-seeming Batgirl doesn't jar. Heck, I'm old enough to remember when DC flat out admitted they were shaving Supergirl back to age 19. Wish they'd do that to me. And yeah, I think this is the first non-JSA etc elderly superhero we've seen.